Spanish astronomer; flourished at Toledo in the first half of the fourteenth century. He was a pupil of Asher ben Jehiel, at whose request (in 1310) he wrote the astronomical work "Yesod 'Olam," the best contribution on that subject to Hebrew literature. It treats of geometry and trigonometry as introductory to the subject-matter; of the structure and position of the globe; of the number and movements of the celestial spheres; of the time differences in days and nights in the various parts of the earth; of the movements of sun and moon; of the solstices, the neomeniæ, the eclipses, and the leap-years; it contains as well astronomical tables and a perpetual calendar. It also deals (iv., § 17) with the chronological systems of other nations, especially Christian; and gives (iv., § 18) in chronological order the noted personages of the Biblical, Talmudic, and geonic periods, following the "Sefer ha-Ḳabbalah" of Abraham ibn Daud. This last was included by Zacuto in his "Sefer ha-Yuḥasin." The "Yesod 'Olam" was first published at Berlin, in 1777, by Jacob Shklower. A more complete edition, with a preface by David Cassel, was published by B. Goldberg and L. Rosenkranz (ib. 1848). Israeli's work was much studied in the Middle Ages. Isaac al-Ḥadib, Judah Bassan, and Elijah Mizraḥi annotated it, and an anonymous author wrote a commentary to it (Neubauer, "Cat. Bodl. Hebr. MSS." Nos. 2044, 746, 5). 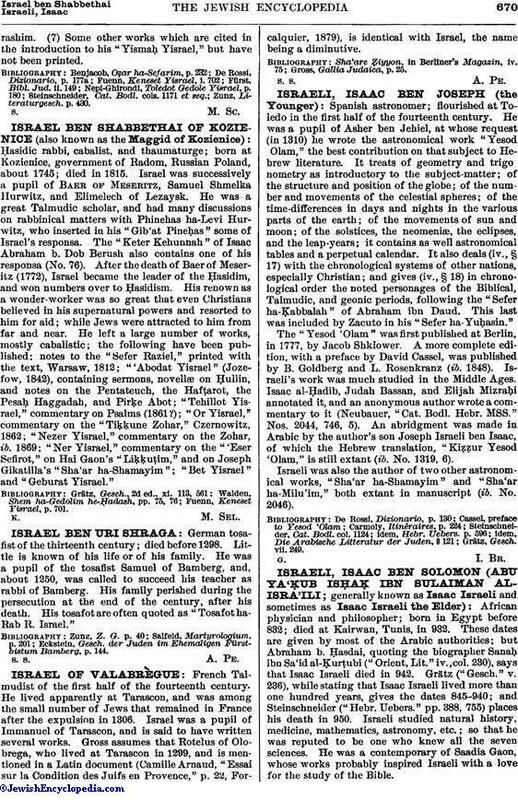 An abridgment was made in Arabic by the author's son Joseph Israeli ben Isaac, of which the Hebrew translation, "Kiẓẓur Yesod 'Olam," is still extant (ib. No. 1319, 6). Israeli was also the author of two other astronomical works, "Sha'ar ha-Shamayim" and "Sha'ar ha-Milu'im," both extant in manuscript (ib. No. 2046).